People have long enjoyed the tropical taste of pineapples. The sweet and tart taste makes dry pineapples a fruit favorite. The hassle of trying to cut a fresh pineapple makes it difficult to enjoy on a regular basis. Harmony House Foods freeze dried pineapple make it easy to enjoy pineapple any time you get a craving for a tropical treat! The pieces are already evenly sliced so you don’t need to do worry about slicing and chopping. The fast drying process used on our dry pineapple fruit locks in all the healthy nutrients turning the Vitamin rich fruit into crisp bites of pineapple delight. One of the great things about dried pineapple is how easy it is to use! The bite sized pieces can be added to a fruit salad. Just add water and they rehydrate instantaneously. For a warm treat on a winter evening, make a pineapple soup that includes your other favorite freeze dried fruits such as strawberries, blueberries, and apples. Or couple our dry pineapple fruit with freeze-dried bananas in your favorite smoothie recipe for a refreshing summer treat! And if you’re in a hurry just grab the jar for a quick and healthy snack on the go! 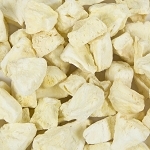 We offer a variety of sizes, including bulk dried pineapple for those looking for wholesale pricing. Freeze dried pineapple is a great food for your health. It boosts high levels of Vitamin C, which can boost your immune system. In addition to other nutrients, dried pineapple is a good source of manganese, which aids in energy production and antioxidant defense. We know how important it is to eat healthy and that’s why we strive to always bring you products with the highest quality. Our freeze dried pineapples are non-GMO, free of heavy metals and pesticides, certified Kosher, and packaged in BPA-free containers! Give us a call at 1-800-696-1395 today to place your order!